Cooking fish can be one of the easiest things to do... and yet, it can be one of the most confusing too. Often overcooked or overwhelmed by too many flavors and ingredients, fish is misunderstood. Tilapia takes on the flavors you cook it with, its a clean slate to work with. In this dish, I've taken super simple (not to mention cheap) lentils, cooked them with a little tomato paste and then simmered the fish on top with a slice of lemon. 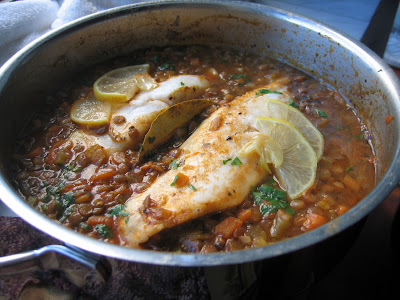 The fish is light while the lentils are filling, and together it's all tasty! You can't really over cook the lentils- (let's say you walk away from the stove for a couple of hours....think of split peas, they will just form a thicker, smoother base the longer they cook.) And you will nestle the fish right into the lentils and cover, which will help keep the fish moist. So, we've got simple flavors and cooking instructions, it's light and yet filling and easy on the wallet. It's fat and happy ... and .... forgiving! Enjoy! Simmer until the lentils are fork tender (this could take up to 1 hour); add the fish when there is still a little liquid in left in the lentils. Now add 2 pieces of tilapia, settle it into the lentils (tilapia is delicate, so be gentle). Top each fillet with a slice or two of fresh lemon and a sprinkling of seasoning salt, cover. Continue to simmer for until the tilapia is flaky (just use your fork and take a peek inside the fish, this is only going to take about 5 minutes. Serve each fillet on a bed of lentils.